For Frank D’Souza, this morning’s news that the royal baby is on its way couldn’t have come soon enough. “We thought about going back to Toronto last night because there wasn’t a lot else to report on” admits Canada’s Citytv News anchor. The imminent birth seems to have woken up the hordes of journalists on duty outside St Mary’s Hospital in West London. 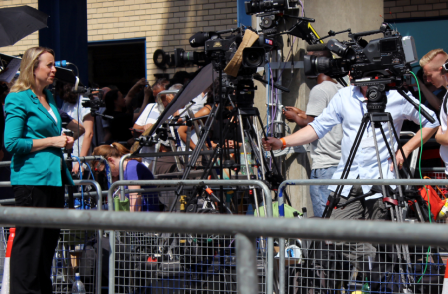 Hundreds of reporters and broadcasters from across the globe have been gathering opposite the hospital’s Lindo Wing for weeks, long before it was announced that the Duchess of Cambridge had gone into labour early this morning (July 22). Photographers, writers and broadcasters now mingle wearily with each other – and a scattering of onlookers – as temperatures peak at 32°c on another sweltering day in London. Television crews from China, Switzerland, Canada and several from the United States, including CNN and NBC, have been encamped for more than two weeks amid a veritable maze of equipment and step ladders. But with so little news emerging from the royal camp, D’Souza and his team weren’t the only ones thinking of heading home. With at least 90 TV crews covering the event, seasoned observers say the media scrum may even have surpassed that which greeted Prince William’s own birth in 1982. “Everyone has wanted and waited to cover this story since their wedding made them into global icons” says Carl Keeler, a freelance reporter from Kentucky who arrived at the weekend. “This event is important to so many people from all over the world – and America in particular it seems. Everyone adores Kate over in the States, so it’s important that we keep them informed of what’s happening here”. To the left of the hospital’s entrance, around150 camera lenses glint in the July sun as photographers jostle for the best view of the door from which they hope the couple will emerge. Yet it seems many are there more in hope of capturing their own slice of photographic history than of making serious money for their efforts. “As there are so many photographers camped out here, all of whom will end up with a similar picture, it’s likely that we’ll make less than £200 each for a nice shot of the couple” Max Grant, a freelance photographer from Camberwell, tells Press Gazette. “But for many of us it’s more about being able to say that ‘we were there’ and have photographs to prove it – that’s worth waiting around in the heat for”. But it seems that the wait may be finally at an end. The growing excitement in the camp suggests the next few days will finally see the assembled press pack actually doing some work.